Case Study: We Increased Conversion 53% Using "Hot Streaks"
Holy Conversions Batman! The Results are in! An increased conversion rate is what we live for at Proof. We test, we tweak, we iterate. Yet, most of the feature updates we create never end up making it to our customers. Because we test them internally, and if they don’t increase conversions, we take them back to the drawing board. With software being easier to create than ever before, we understand that our users don’t need more features. They have a job that they need our product to do. Plain and simple. 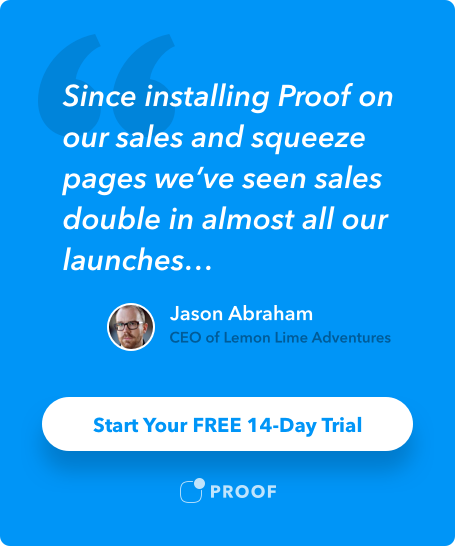 Proof’s job-to-be-done is to increase website conversions. Today, I’m happy to announce our recent split test WINNER in our new product, Hot Streaks. It ain’t every day you see a 53% conversion rate increase! We created Hot Streaks so we could show our visitors how many people signed up for Proof or visited our site over a recent period of time. It would highlight the sites that had real traffic and real sales, and those sites would differentiate themselves from lower quality competitors. Our hypothesis: Hot Streaks would increase visitor to trial conversion rate 10% on the Proof homepage. We created a split test using Google Optimize and hit launch. 32,000 visitors later, and we were shocked by the results. The home page variation with Hot Streaks on it converted 53% better than the homepage without. We wanted to be sure we reached statistical significant of 97.5% so we popped our results into this A/B testing calculator and got back results we felt good about. We run a lot of tests at Proof, and this is by far the biggest conversion increase we’ve achieved in one single test. In fact, most tests fail. While every traffic source, offer, and audience is different, Hot Streaks came out of the gates crushing it and I expect it to improve conversions for webinar registration pages, SaaS businesses, lead magnets, E-commerce stores and more. I can’t guarantee it’ll get you 60% conversion rates like some of our other customers, but I’m betting it’ll help. I’d love for you to test Hot Streaks on your site risk-free for 14 days.